No more lines or extra check-cashing fees. Don't wait to get your money faster. Apply for a RushCard and enroll in Direct Deposit today! Please correct application error(s) below. Pick from one of five designs that fits your style. Click below to pick a monthly plan that fits your life. I want a flat monthly fee with unlimited purchases. I want to pay as I go for each purchase. I agree to receive offers, promotions, and updates. The following disclosures are required by the Federal Electronic Signatures in Global and National Commerce Act (“E-SIGN”). In order to open a Prepaid Visa RushCard® (the “Card Account”) electronically, you must acknowledge receipt of these disclosures, agree that you have read the disclosures and consent for the electronic delivery of all statements, disclosures and notices. We may amend or change the terms and conditions of this Consent for the Electronic Disclosure of Information at any time. 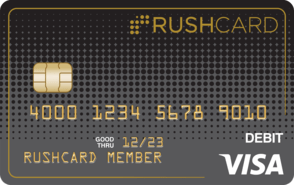 For the latest version, please review online at www.rushcard.com. Consent for the Electronic Disclosure of Information: By clicking Agree & Submit on the application submission page, you acknowledge receipt of the E-Sign Disclosure and Consent, that you have read the Consent for Electronic Disclosure of Information and you affirmatively consent to the electronic receipt of any and all statements, disclosures, notices, terms and conditions, and other documents, and all subsequent changes thereto, related to the Card Account (collectively, “Statements”). We will provide subsequent disclosures to your email. Please be sure your email address and other contact information is correct by visiting our website at www.rushcard.com or calling us at 1-866-787-4227. 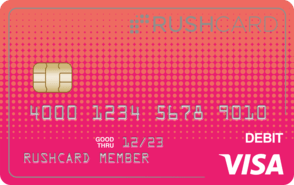 After you consent to the electronic receipt of statements and activate your RushCard, Statements and your available card balance are available at no additional cost online at www.rushcard.com or by calling 1-866-787-4227. You agree that we do not need to provide you with a written (non-electronic) copy of any Statement, unless you specifically request us to send you a copy. Paper Delivery of Disclosures and Notices You may choose to have a paper copy of any particular Statement mailed to you by contacting us by phone at 1-866-787-4227, electronically at agent@rushcard.com or you may write to the Program Provider via mail at UniRush LLC, P.O. Box 42482, Cincinnati, OH 45242. Be sure to state that you are requesting a paper copy of a particular Statement. System Requirements to Access Information: In order to access, receive and retain Statements electronically, you must provide at your own expense an Internet connected device that is compatible at the time of such access with the minimum requirements outlined below. A personal computer or other device which is capable of accessing the Internet. Your access to this page verifies that your system/device meets the requirements. An Internet web browser capable of supporting 128-bit SSL encrypted communications, which requires a minimum web browser version of either Microsoft® Internet Explorer version 9 (available for downloading at https://www.microsoft.com/en-us/download/internet-explorer.aspx") or a comparable browser and your system or device must have 128-bit SSL encryption software. Your access to this page verifies that your browser and encryption software/device meet the requirements. You must have software which permits you to receive and access Portable Document Format or “PDF” files, such as Adobe Acrobat Reader® version 8.0 and above (available for downloading at https://get.adobe.com/reader/). Your access to this page verifies that your system/device has the necessary software to permit you to receive and access PDF files. Statements in Writing: All Statements in either electronic or paper format are in writing. Please print or download for your records a copy of this disclosure and other Statements. Federal Law: You acknowledge and agree that your consent for the electronic disclosure of Statements is provided in connection with a transaction in or affecting interstate commerce that is subject to and governed by the federal Electronic Signatures in Global and National Commerce Act. Withdrawal of Consent for Electronic Delivery of Information: You may withdraw your consent to receive any future Statement electronically by contacting us by phone at 1-866-787-4227, by withdrawing your consent online via the cardholder website, by fax at 1-866-931-7874, electronically at agent@rushcard.com or you may write to the Program at UniRush LLC, P.O. Box 42482, Cincinnati, OH 45242. If you withdraw your consent we will mail paper versions of all Statements to you for no additional cost. Unless you request to receive monthly paper statements, the monthly paper statements will not be mailed to you. You may request to receive paper monthly statements be mailed to you by calling us at 1-866-787-4227, emailing at agent@rushcard.com or you may write to the Program at UniRush LLC, P.O. Box 42482, Cincinnati, OH 45242. If you have withdrawn your consent and you desire to give consent, you may contact us by any of the means noted above to consent for electronic delivery of information. Plan Fee $0 $7.95† per mo. We charge 8 other types of fees. † Fee is $5.95 with payroll or government benefit direct deposit in prior month. For general information about prepaid accounts, visit cfpb.gov/prepaid. Find details and conditions for all fees and services in the cardholder agreement. 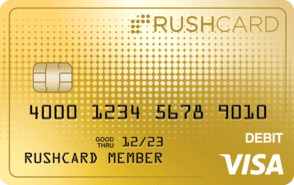 RushCard® Prepaid Visa® Card is issued by MetaBank®, Member FDIC, pursuant to a license from Visa U.S.A. Inc. Card is serviced by Green Dot Corporation. Card purchase $9.95 $9.95 A one-time fee of $3.95 or $9.95, depending on the plastic design you request for your Card. This fee is paid by you when you first load funds to your Card. It is also assessed if you change your Card design when you request a replacement Card. Monthly fee $0 $7.95 Monthly fee is $5.95 if you receive a payroll or government benefit direct deposit to your Card in the prior calendar month. For your first month, the monthly fee will be prorated and assessed on the date you first load funds to your Card. Thereafter, the monthly fee is assessed on the first day of every month. If your balance is less than the monthly fee, your balance will be applied to the fee amount and any future load of funds that month will be applied to the remainder of the monthly fee. Direct deposit $0 $0 No fee for direct deposit. Cash reload $5.95 $5.95 Fees of up to $5.95 may be collected by our reload agents when reloading your Card at their locations. This fee is charged by the reload agent and is subject to change. This fee is not deducted from your Card account and will not be reflected in any transaction histories. Reload locations may be found at https://www.rushcard.com/fund-account. Mobile check load - standard $0 $0 This is a third-party service. Standard text message or data rates may apply. Mobile check load – expedited (government and payroll checks with a pre-printed signature) Greater of 1% or $5.00 Greater of 1% or $5.00 Per check load. Percentage taken of total check amount. Fee deducted from check total prior to loading your Card account. This is a third-party fee and is subject to change. This fee is not deducted from the Card account and will not be reflected in any transaction histories. Standard text message or data rates may apply. Mobile check load – expedited (all other accepted check types) Greater of 4% or $5.00 Greater of 4% or $5.00 Per check load. Percentage taken of total check amount. Fee deducted from check total prior to loading your Card account. This is a third-party fee and is subject to change. This fee is not deducted from the Card account and will not be reflected in any transaction histories. Standard text message or data rates may apply. Per purchase $1.00 $0 Fee charged each time your Card is used for a purchase transaction. The fee will be assessed when your transaction actually posts. Card-to-Card transfer $0.99 $0.99 Assessed if you initiate a transfer of funds from your Card to another cardholder’s Card. There is no fee to transfer funds from between your Card accounts. ATM withdrawal (in-network) $0 $0 "In-network" refers to all ATMs in our network that are surcharge-free. To find an in-network ATM, visit www.rushcard.com. ATM withdrawal (out-of-network) $3.00 $3.00 This is our fee. "Out-of-network" refers to all ATMs outside of our network of surcharge-free ATMs. 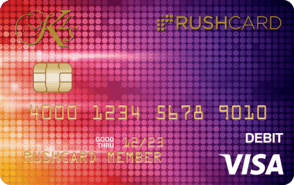 To find an in-network ATM, visit www.rushcard.com. You may also be charged a fee by the ATM operator, even if you do not complete a transaction. Teller cash withdrawal $3.00 $3.00 This is our fee for a cash withdrawal via a teller at a participating bank. Express cash fee $30.00 $30.00 Assessed if you request to receive the balance of your Card sent to you via cash through one of our designated reload agents if you have reported your Card as lost or stolen and do not have access to your Card balance. Customer service $0 $0 No fee for calling our customer service line, including for balance inquiries. ATM balance inquiry $0.50 $0.50 You may also be charged a fee by the ATM operator. International transaction 3% 3% Of the U.S. dollar amount of each transaction. International per purchase $2.00 $0 Fee charged each time your Card is used for a purchase transaction outside the U.S. The fee will be assessed when your transaction actually posts. Charged in addition to the international transaction fee. Inactivity $1.95 $0 Fee charged per month after 90 consecutive days of no transactions or loads, except where prohibited by law. Card replacement (regular delivery) $5.00 $5.00 Per lost, stolen, or damaged Card replaced on a non-expedited basis (generally within 7-10 business days). Card replacement (expedited delivery) $30.00 $30.00 Assessed if you request a replacement Card to be delivered on an expedited basis of two to three days. Charged in addition to the replacement Card fee. Bill payment stop payment $30.00 $30.00 Per stop-payment order for a payment scheduled using our bill payment service. No fee for the first stop-payment order in a calendar month. Your funds are eligible for FDIC insurance. Your funds will be held at or transferred to MetaBank, an FDIC-insured institution. Once there, your funds are insured up to $250,000 by the FDIC in the event MetaBank fails, if specific deposit insurance requirements are met. See fdic.gov/deposit/deposits/prepaid.html for details. Contact Customer Service by calling 1-866-RUSHCARD (866-787-4227), by mail at P.O. Box 42482, Cincinnati, Ohio 45242, or visit www.rushcard.com.